Love Letter is a light but clever little card game for two to four players from designer Seiji Kanai. It costs well under £10 (you can usually find it closer to £5) and while it has an official playing time of 20 minutes, it is played in a series of extremely short rounds (maybe five minutes) – so it can be as long or short as you want it to be (eg, you could play best of three in 15 minutes, or first to 10 for an hour or more). The game is also incredibly light on components. Essentially all you need to play is the 16-card deck – yup, just 16 cards. However in the standard edition you’ll also find a rulebook, some player aid cards, wooden cubes (for keeping score) and a nice drawstring bag to put everything in. Each card represents a character and their position in the princess’ personal hierarchy; from several lowly guards (1) and priests (2) up to the king (6), countess (7) and the princess (8) herself. Your job is to get your love letter to the princess (its current whereabouts is represented by the card you currently have in your hand) to win her favour. This artwork style is discussed below (in Key observations), but for me the AEG version (pictured) is reasonably well presented without being spectacular. The cards are well laid out and clear, but as this is a game where very few cards get an awful lot of use the card quality isn’t the absolute best. You may want to get some plastic sleeves for them, as you really don’t want to play this game with marked cards. In terms of gameplay, it really couldn’t be simpler. The 16 cards are shuffled, the top card is removed from the round, then each player is dealt one card. On your turn, you draw a card (so you have two in hand) and then play one of them – carrying out the effect text on the card. If this doesn’t end the round (because there’s only one player left), the next player in clockwise order does the same. If you get through all 16 cards and more than one player has yet to be eliminated, the player with the highest value card left in their hand wins the round. What makes the game (if you’re a fan) is the interplay between the cards. Some actions are forced, some require a blind luck leap of faith, while others will benefit from a little deductive reasoning. After a few rounds most players are pretty much sure to have cursed their luck as they go out without playing a single card; boasted of their superior reasoning skills; then taken a few blind luck wins for good measure. There’s really not much to teach and what there is to learn is probably best done at people’s own expense; it’s fun to laugh as someone realises their mistake in a round as they’re not going to make it again (well, until next time). And this really isn’t a game you care about winning – the fun is definitely in the taking part. If anything, that’s what you’ve got to get across when you explain the game. The writer: While Love Letter is an achievement in game design minimalism, and can be credited with starting the micro game trend, there’s so little too it… yet despite myself I come back for more. It certainly appeals to my inner child, raises a laugh with the right people and is a great icebreaker. Not everyone will ‘get’ it, but for such a small investment – in time and money – its always worth a shot. The thinker: I can see why the design is admired, but calling this a ‘game’ is quite the stretch – most rounds you can leave your brain at the door. Sometimes this simply leaves me cold and I’d rather sit out and chat, but after a few adult beverages with the right crowd I have been known to play a few rounds with a smile on my face. Is that because of the game or the beer? That would be telling. The trasher: I was interested in Love Letter when I heard about it, but having played a few rounds – what’s the point? Sure it’s clever, sure it’s brutal, but am I in control? No. Is a win satisfying? No. It’s only saving grace is that with more than two people there can be a bit of ‘bash the leader’ fun, but even that is short lived. This one really isn’t for me. The dabbler: I’m totally up for this, all the time! This is a great game for the family, for parties, the train, Christmas, whatever. It’s short and sweet (if you want it to be) while generating laughter, forehead slapping mistakes, and unbelievably rotten (or fantastic) streaks of fortune. No, I don’t want to play it all evening – but I’m happy to play it every evening on game nights. The big question seems to be, is Love Letter even a game? Apparently some 44 per cent of the two-card combinations you may end up with have been shown to include very little or no decision making potential at all; so close to half your turns will probably be purely scripted. And the rest, in honesty, are often about guesswork. But then, is this a problem? With the right crowd (and the game has proven extremely popular) it proves to be a real winner and when it’s only costing you pennies (and there will certainly be a second-hand market) – just how wrong can the decision to buy this go? Yes, it’s a Marmite game – but in a world where the majority of the people seem to love Marmite. For those who do like Love Letter, artwork is a big source of debate. The original featured Japanese anime style art, but US publisher AEG decided to put their reprinted version into its ‘Tempest’ universe, which has slightly comic style art and is set in a made up European Renaissance-style city state. It also made one small rule change, making one card a little more forgiving (not that you couldn’t play with the original rule if you wanted to). It’s fair to say there was a bit of a negative reaction to this decision from some. Personally I’m fine with the new art, especially because it’s such a light and breezy experience. But to appease the knockers, AEG released a new version of the game in 2013, Love Letter: Kanai Edition, featuring the original artwork and rules (its just a little more expensive). So until that edition goes out of print, it’s a moot point. I’ve had a lot of fun while playing Love Letter. I rate it an eight and am always happy to have a game. And interestingly while the game is extremely basic, I can’t see myself getting bored if it – purely because of the reactions it brings to the table. Since its 2012 release this little card game has really captured the Western gaming public’s imagination; a particularly impressive feat when you bear in mind its humble beginnings with an independent Japanese games publisher. It is now ranked in the top 100 games on Board Game Geek, putting it in the top 10 family games (January 2014) – an amazing feat for a light filler card game. NOTE: I usually take (admittedly crappy) photos of my own copy of the game. 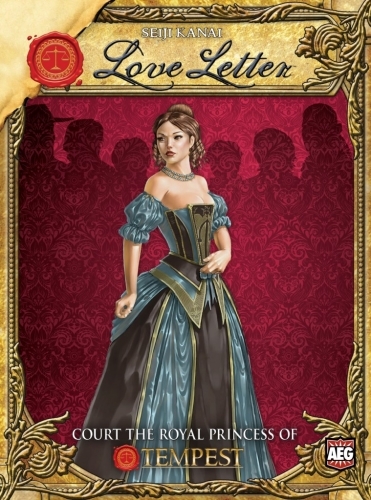 I picked Love Letter up for just three euros at Essen 2012; cheap because it was just the cards, rules and player aids. For this reason, I used game images from AEG’s official website to better represent what you’ll get in a ‘proper’ retail version. This entry was posted in Board games, Games and tagged Board game review, boardgame review, card game review, Love Letter, Love Letter review, microgame, Seiji Kanai by Chris Marling. Bookmark the permalink.